Friedman Memorial Airport, the gateway to Sun Valley, is built on land donated by the Friedman children and named in memory of their father. S.J. Friedman arrived in Idaho in 1869 to raise cattle and sheep and was elected Hailey’s first mayor. Friedman Memorial Airport covers an area of 211 acres (0.85 km2) at an elevation of 5,318 feet (1,621 m) above sea level. It has one asphalt paved runway designated 13/31 which measures 7,550 by 100 feet (2,301 by 30 m). For the 12-month period ending May 31, 2007, the airport had 68,540 aircraft operations, an average of 187 per day: 58% general aviation, 38% air taxi, 3% scheduled commercial and <1% military. At that time there were 150 aircraft based at this airport: 67% single-engine, 25% multi-engine, 5% jet, 1% helicopter and 1% ultralight. The Friedman family donated much of the land for the airport to the city of Hailey in 1931 and the airport was officially recognized in 1932. According to historic photographs, the site had been used for aviation as early as 1916. Scheduled commercial passenger service began at the airport 59 years ago in August 1960 with the arrival of West Coast Airlines, a forerunner of both Air West and Hughes Airwest. According to various West Coast Airlines system timetables during the 1960s, the airline was serving Sun Valley with Douglas DC-3 and Piper Navajo twin prop aircraft. West Coast successor Air West briefly served Friedman with Piper Navajo twin prop commuter aircraft with nonstop flights to Boise and Salt Lake City as well as direct, no change of plane service to Portland, OR following West Coast's merger with Bonanza Air Lines and Pacific Air Lines to form Air West in 1968 while successor Hughes Airwest never served the airport. Instead, Hughes Airwest operated its Douglas DC-9-10 and McDonnell Douglas DC-9-30 jetliners into the Magic Valley Regional Airport (TWF) in Twin Falls which it advertised in its various system timetables during the 1970s as being the "jet gateway" for Sun Valley. Delta Air Lines is the dominant carrier at the airport via its Delta Connection service which was operated for many years by SkyWest Airlines with Embraer EMB-120 "Brasilia" turboprop aircraft. In January 2014 this Delta Connection service was enhanced and expanded with SkyWest-operated Canadair CRJ-700 regional jet flights. Delta now operates the most flights with year-round nonstop service to its Salt Lake City hub only. United Airlines started seasonal service during the winter ski season in 2013 nonstop from San Francisco which was operated by SkyWest Airlines flying as United Express using CRJ-700 regional jets. Later that year, United Express announced that it would expand its service to add nonstop summer flights from San Francisco. Later, United Express announced their new nonstop CRJ-700 regional jet flights to Denver effective in July 2014. Alaska Airlines, via its wholly owned regional partner Horizon Air, operate nonstop flights to Seattle with Bombardier Q400 turboprop aircraft which is the largest and fastest member of the Dash 8 turboprop family. More flights operate during the winter ski season than any other time of year from the airport. Alaska/Horizon usually has 100 days of service to Los Angeles from mid December to late March. Horizon Air began serving Sun Valley late in 1983 with nonstop flights to Seattle and Boise operated with Fairchild F-27 turboprop aircraft. Historically, in addition to the aforementioned West Coast Airlines and Air West propellor aircraft service, the airport had scheduled passenger jet flights provided in the past on a seasonal basis during the winter ski season operated by Horizon Air and America West Airlines. Horizon Air flew Fokker F28 Fellowship jets nonstop to San Francisco and Seattle while America West flew Boeing 737-300 jetliners nonstop to Los Angeles, Phoenix and Boise with direct, no change of plane jet service to Las Vegas and San Jose, CA. The Boeing 737 was the largest aircraft ever to serve Sun Valley on a scheduled basis. Following the cessation of these F28 and 737 flights, the airport did not have scheduled passenger jet service for many years until Delta Connection and United Express introduced Canadair CRJ-700 jet flights into Sun Valley in 2013 and 2014 respectively. In the 1970s, the airport was served by Sun Valley Airlines (later "Sun Valley Key Airlines" which then changed its name to Key Airlines) using de Havilland Canada DHC-6 Twin Otter, Convair 440, Piper Navajo and other propeller-driven aircraft. The airfield was also briefly served over the years by Gem State Airlines, Mountain West Airlines, Golden Gate Airlines and Scenic Airlines. Transwestern Airlines provided service for two years, until sidelined by a non-fatality accident near Hailey in 1983 which involved an emergency landing attempt on Highway 75. It was acquired later that year by Horizon Air, which began service in the early 1980s. Air Idaho served the airport as well during the mid 1970s with de Havilland Heron four engine commuter prop aircraft. ^ "Airport History". Friedman Memorial Airport. Archived from the original on March 22, 2013. Retrieved April 4, 2013. ^ "DELTA Adds Seasonal Seattle – Sun Valley Flights from Dec 2016". routesonline. Retrieved 21 June 2016. ^ "United schedules additional seasonal Los Angeles routes from Dec 2018". routesonline. Retrieved 12 July 2018. ^ "Idaho Commerce - New San Francisco/Sun Valley Non-Stop Flights Begin December 12". 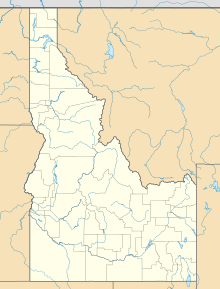 commerce.idaho.gov. Archived from the original on 2015-11-21. Retrieved 2015-11-20. ^ "All aboard live through plane crash near Hailey". Spokesman-Review. Associated Press. February 16, 1983. p. A6. This page was last edited on 5 March 2019, at 02:20 (UTC).